So many people have seen the image of suffrage activist Inez Milholland on her white horse leading the March 1913 suffrage parade in Washington, DC that it has almost become a cliche. Well, this may be an exaggeration because a large segment of the U.S. population has never heard of Milholland. So it will be some time before the dramatic image of this well-publicized activist will become old hat. You’ll be doing your part by getting prepared for the 2016 centennial observance of Milholland’s death by purchasing Remembering Inez: The Last Campaign of Inez Milholland, Suffrage Martyr by Robert P.J. Cooney, Jr. The 2020 suffrage centennial will hopefully feature America’s suffrage martyr prominently. Remembering Inez is an enormous step in the right direction in terms of presenting images associated with Milholland’s life and times that haven’t been in general circulation before this. With this work, we’re treated us to the little-known perspectives of those who worked with and loved this extraordinary activist in this offering by American Graphic Press. And that makes it a candidate for a special gift this holiday season. A great deal was written about Inez Milholland in the newspapers of her time. The appeal of Milholland’s attraction (mind and body) is complex and many insights can be gained by reading the excellent biography of Milholland by Linda J. Lumsden. In fact, these two books together will bring a broad smile to the face of the suff buffs in your family and circle of friends. The Cooney book highlights impressive photography of the period and what Milholland’s contemporaries had to say about her. In every instance it’s a remembering with thoughtful and profound feeling. And we’re treated to some of Milholland’s own words about the movement and what the activists were up against in their uphill campaign to win the franchise. Robert P.J. Cooney, Jr. is the author of Winning the Vote: The Triumph of the American Woman Suffrage Movement , a classic work that details the many campaigns involved with winning votes for women before 1920. Winning the Vote was produced in conjunction with the National Women’s History Project. It’s a basic reference book worth owning, loaded with images that will keep you fascinated from page one to the end, and it’s a hefty tome indeed that anyone interested in the suffrage movement shouldn’t be without. If you order through the National Women’s History Project, you’ll be supporting a terrific organization in its 35th year in 2015, and occasionally there’s a worthwhile discount not available from other retailers. Cooney started the Woman Suffrage Media Project in 1993 and he created and co-edited The Power of the People: Active Nonviolence in the United States. 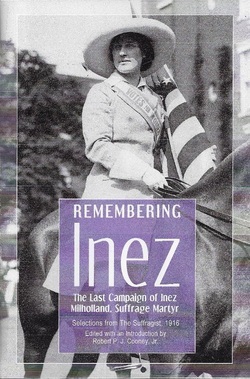 Remembering Inez is an essential and important work to add to any suffrage movement library. Order the book now at the specially dedicated web site: RememberingInez.com And follow SuffrageCentennials.com with email and Twitter for news and views about upcoming suffrage centennial celebrations. This entry was posted on December 7, 2014, in Blog and tagged 2020 suffrage centennial, Inez Milholland, suffrage centennials, suffrage history, womens suffrage. Bookmark the permalink. ← NEWS BREAK: The proposed Harriet Tubman national park might fit on Santa’s sleigh this year!